Routine maintenance can help prevent an expensive marine diesel service repair or even worse, an emergency at sea. Fortunately, there are a number of easy-to-do steps that every boat owner should know to ensure their marine diesel engine remains operating at peak performance. Perhaps the very best tip to not only remember but live by is to never let your vessel sit in storage or at the docks for too long. Putting the marine diesel engine to use will help it not only keep its value but also the longevity of the engine itself. Even if you are not using your boat it is still important to run the diesel marine engine on a regular basis. Remembering this can guarantee you will continue to enjoy the engine and prevent a costly marine diesel engine repair service. Continue reading to learn more useful tips to avoid marine diesel service repair in the article below. 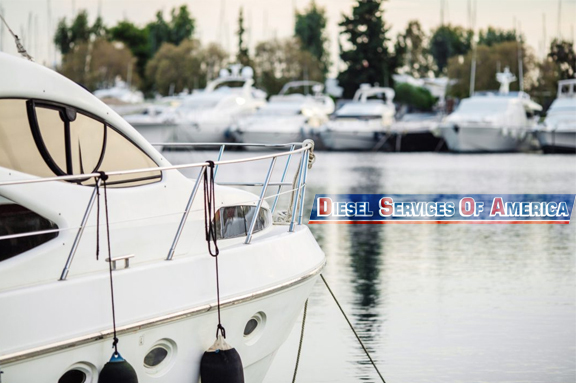 If you have any questions concerning marine diesel engine services then be sure to contact Diesel Services of America today to speak with a friendly team member. Just like automobiles, boat engines like diesel marine engines require regular oil changes to ensure the engine is running properly. Determining when to change the oil on a marine diesel engine, however, is slightly different from that of an automobile engine. In automobiles, changing the oil is determined by the number of miles driven. Marine diesel engine oil changes are measured not in miles but in hours used. As a rule of thumb, for every one-hundred and fifty hours runtime, the marine diesel engine’s oil should be changed. If you do not operate the engine for one-hundred and fifty miles in a year then change the oil annually. The strainers on a marine diesel engine provide a vital role by keeping things in the water such as foreign objects and seagrass from entering the water pump. Ensuring that the strainers are kept clean is very important in preventing costly marine diesel engine service repair. Routinely inspecting and cleaning the strainer is relatively easy and should be considered as part of regularly maintaining your marine diesel engine. In the event that your diesel marine vessel does not have a filtration system like strainers then it is highly recommended to add one. Fuel polishing or a fuel cleaning system is a method of cleaning fuel by removing certain impurities which can clean the tanks and return them to a condition similar to when they were first filled. This is done by using a pump to take the fuel located in the storage tanks and filter it through either magnetic fluid conditioners (MFC) or water particle filters. Fuel polishing can not only improve the fuel economy of the diesel marine engine but is considered the best way to perform fuel maintenance.